Eden Juniors was formed in 1999. And have just celebrated our 10th anniversary.We are members of the North of England Athletic Association (NoEAA) affiliated for Track and Field, Cross Country and Road running. We meet on Thursday evenings from 6pm prompt until 7pm. During our summer training, April – October, we meet at the wooden pavilion on the playing field at QEGS. During winter training, October – April, we meet in the sports hall at QEGS. We run in all weathers and during most of the school holidays. (We usually have Christmas off). By coming 1st in her age group 15-19 at a Triathlon in Northampton,Vicky has been chosen to represent GB at the Europeans sprint championships at Althone ,Ireland on the 3rd in July. She has represented Eden Juniors for over eights years at both Track and cross country and was county champion and held the U15 800m record before sustaining a stress fracture.Because she was unable to run she took up cycling and swimming to keep up her fitness .Her Coach Jenny suggested she tried Triathlons . She did her first in August 2008 and has gone from strength to strength .This is so well deserved after years of dedication to training and I am sure we are all thrilled for her and wish her continued success. Firstly, welcome to Eden Runners Juniors! We’re delighted you have joined us and glad you are interested in running and athletics and becoming one of Eden Juniors Athletes. As a new member, you will be interested to hear what we do, when we do it and what you’ll need to do it. Where and when we meet. We meet on Thursday evenings from 6pm prompt until 7pm. During our summer training, April – October, we meet at the wooden pavilion on the playing field at QEGS. During winter training, October – April, we meet in the sports hall at QEGS. We run in all weathers and during term time and also the main summer school holiday. Each week, you will need to come in comfortable clothing to train in, suitable footwear, a waterproof jacket if the weather is bad (we run in all weathers) and very importantly, plenty of water to drink. If you are running outside in the colder months, you may also need a hat and gloves. What you will be doing each week. Each week, you will be grouped by age and also by whichever activity you want to take part in, particularly during the summer season as we focus mostly on track events such as sprinting, long jump, high jump and javelin. There are lots of games involved for the younger age groups! The subscription fees are due twice yearly in October and April. Currently, the rates are £30 for one child, £50 for two siblings and £60 for three siblings. The fees go towards the weekly hire of the hall and equipment for training. We do not make any profit from subscription fees and attempt to keep these fees low. Please pay your subscriptions promptly. We accept all abilities and in return hope for a positive attitude and commitment from our members. We also expect children to represent Eden Runners competitively. Unfortunately, due to insurance restrictions, we cannot accept any members below the age of 8. If you have any friends or younger siblings who wish to join Eden Runners Juniors then their parents must contact the membership secretary who has a waiting list (erjuniors@hotmail.co.uk). It cannot be assumed that a child can join because they have had their eighth birthday. Some children have been on the waiting list for some years.Priority is given to the children who have been on the waiting list for the longest time as spaces become available. It is important to point out that all of the adults who contribute to running Eden Runners Juniors, do so completely voluntary. The group would not exist if these people did not offer their time, energy and experience for free. All of the coaches are happy to do this and hope for some commitment from members in return. (All of our coaches are CRB checked and suitably qualified). With this in mind, we are always seeking offers of help from parents/carers. If you feel you can offer help in any way or would like to become more involved with coaching the children, please speak to one of the coaches on club night. The more adult support we have, particularly in the form of coaches and helpers, the better the quality of training we can offer to the children. We want you to take your training seriously whilst at the same time having fun and maintaining your interest in running, jumping and throwing. We will encourage children to enter and compete, representing Eden Runners in The Cumbria League – Cross Country and Track & Field Athletics. There are competitions for beginners where anyone can join in and others which you must be selected for. Every junior can take part and we especially welcome any youngsters who would like to take part for the first time. For more information please contact the coaches. Eden Runners hope to have as many children representing them as possible for these events. With Eden Runners Juniors you will have the opportunity to take your training and competition quite far. We have a few members who compete nationally. We expect all children to wait at the end of training for a quick debrief. This only takes a few minutes and will have information of events and competitions taking place. We also expect parents to be present at these debriefings so they can hear information first hand. If you wish to buy Eden Runners Vests, Sweatshirts or Jackets, please contact Anthea Hayhurst before or after practise time. Finally, if you choose to leave the club, please inform the membership secretary. This allows us to keep the waiting list time short. It will be assumed that children have left the club if they have not attended for five consecutive weeks. (Obviously if there is good reason to be absent for a consecutive period of weeks, e.g. holiday, illness etc there will be no problem, but you must let us know.) We cannot hold places for children who are temporarily attending other clubs. We cannot hold places for children who want to have a term off. We always have children on the waiting list desperate for a place. Please do not hesitate to speak to any of the coaches if you have any queries. The Cumbria Track League is a good introduction to competition and it can be fun to better your own time and compete against yourself at these events. All that is needed is a positive attitude to give it a go. While if you give the Cumbria Cross Country League a go you’ll be amazed at how racing improves your performance. Club vests must be worn. Buy, beg, borrow, but do not steal! Megan bates raced to probabley the best result of her career so far when she won the under- 15 girls 800m at the Northern Athletics championships, held at the new leigh sports village near Manchester. 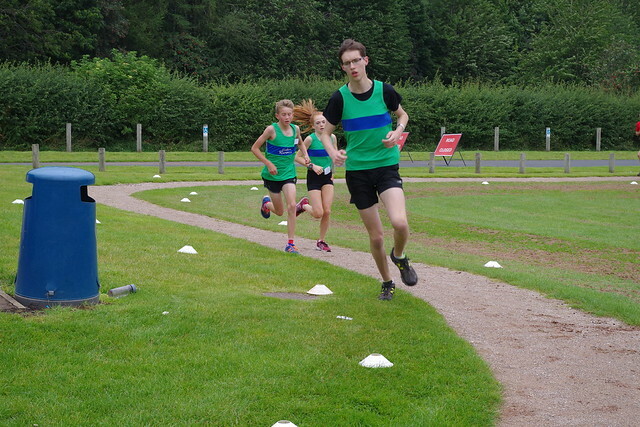 After qualifying with the fastest time out of the three heats, Meagan led from the start to finish and came home in a new P.B of 2.15:42 .Meagan will be a major contender for hounours in the English Schools Championships,to be held in Birmingham in July. The subscription fees are £30 for one child, £50 for two siblings and £60 for three siblings due twice yearly - April and October. The fees go towards the weekly hire of the hall and equipment for training. We do not make any profit from subscription fees and attempt to keep these fees low.